Why did the Straits Times censor MM Lee’s remarks about Obama being a “very great” man? See TOC’s Facebook page here. 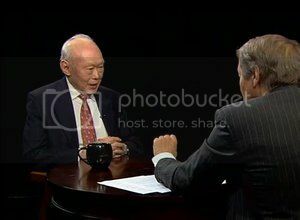 Minister Mentor Lee Kuan Yew gave an interview with Charlie Rose on the “Charlie Rose Show” (Bloomberg TV) on 23 October. The following are excerpts from the interview. CHARLIE ROSE: You’ve never had a moment where you thought Singapore was too authoritative did you? Not one moment? LEE KUAN YEW: My job was to get the place going and get everybody a decent life and a decent education. And we’re now the best educated people in the whole of east Asia. Our universities — we got three, four universities, fourth one coming up. CHARLIE ROSE: So the end justifies the means whatever it might be? LEE KUAN YEW: No. The ends were laudable. Everybody wants the same ends. Everybody wants good education and good health. CHARLIE ROSE: A good life and their children to do better than they did. LEE KUAN YEW: The means — I had the consent and support of the population. If they opposed me and they did not cooperate, it wouldn’t have worked. CHARLIE ROSE: You were in control of everything. CHARLIE ROSE: Yes you were, you know that. LEE KUAN YEW: The numbers of people opposing me, including the communists in the very early years, was endless. CHARLIE ROSE: That brings me to President Obama. What are your observations about him? LEE KUAN YEW: He’s a very great and eloquent man who is very persuasive and is very able and has appointed very able people into his key positions. And what impressed me most is his appointing people of different minds. For instance, on his economic team, there is Summers Paul Volcker, and they’re both very strong minded people. Watch the interview on TOC Youtube channel. Click here for the full transcripts on TOC’s Facebook page.